I chose Animas for several reason, them being: a small environment, student the teacher relationship, unique learning, and the option to be whoever you want to be. The small learning environment was very crucial to my family to help me succeed. 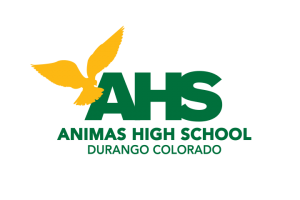 I went to a very large middle school and I did not end up doing very well, so we thought Animas would be able to help with that. The student- teacher relationship is something I have longed for, but have never received. The teachers at the school are incredibly nice and have a desire to help you succeed, unlike most schools. At Animas, you are given an abundant amount of trust and are treated like an equal, compared to the teachers. The learning style at Animas is why I will never change schools. I did not do well reading out of textbooks constantly and taking quizzes on the many words in the book I could hardly understand. I love getting hands on and making projects and I never thought I would be able to do that. Lastly, at Animas, you don't have to worry about what people think of you and i really like that. There are no "cliques" or groups of people that will exclude someone, which makes it is a loving community of students.